There is no greater delight than digging into Asian cuisine. From the sensational smell to the flavors and textures, Chinese, Thai, and Vietnamese food is some of the best out there. But what’s even better is that Asian cuisine is healthy. Sometimes it can be hard to believe because it tastes so dang good, but it’s true — you can enjoy a healthy meal that tastes divine. Here at Mi Pho Song Vu, we’re dedicated to serving our customers with fresh and delicious cuisine, and we’re proud to say that our menu is not only versatile and appetizing, but it’s healthy. Chinese, Thai, and Vietnamese food incorporates fresh vegetables that have incredible health benefits. And so, in today’s blog post, we want to share with you a few of these in regards to Vietnamese food. Continue reading to learn how indulging in Vietnamese cuisine can actually be great for your health. Vietnamese cuisine is full of herbs that add fresh flavor to the dish. These herbs include spearmint, peppermint, basil, lemongrass, and coriander, just to name a few. Not only does the inclusion of these herbs add to the overall taste of the dish as a whole, but they help promote healthy digestion, as well as offer relief for nausea and headaches. Chances are you’ll feel a whole lot better after a delicious Vietnamese meal. 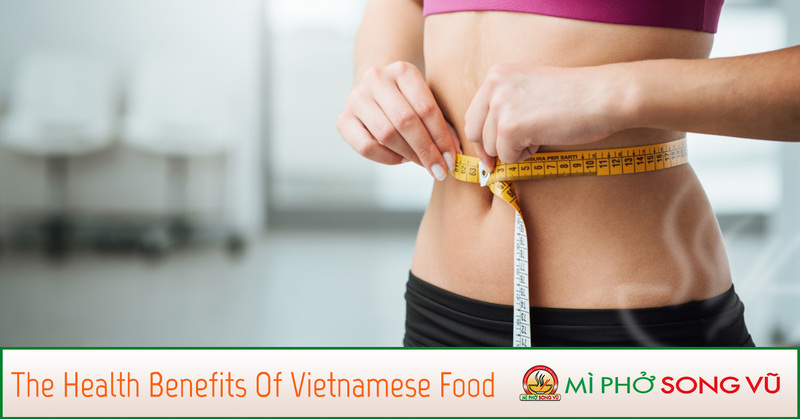 One of the greatest things about Vietnamese food is that it is low-calorie and low-fat. Instead of being full of ingredients that are rich in fats, it’s full of herbs, spices, and fresh vegetables. You can eat a Vietnamese dish every meal of the day and not gain weight. Vietnamese cuisine is low in sugar, so those who suffer from high blood sugar can enjoy a dish without worrying that their sugar intake is shooting through the roof. If you’re struggling with your blood sugar, you can find some peace of mind when you eat Vietnamese food. Both vitamin A and E are found in the herbs and spices that are found in Vietnamese dishes. Vitamin A has healing properties and provides smooth skin and wards off wrinkles, while vitamin E is an antioxidant that fights free radicals in your body and reduces the aging process. Eating Vietnamese food will work toward giving you clear, smooth, and young looking skin, from the inside out. Like we’ve mentioned all throughout this post, Vietnamese cuisine is full of vitamins and minerals that are essential to keeping you healthy. Not only do they work for the benefit of your skin, but they actually fight fatigue and works to boost your immune system. If you feel a cold or any type of sickness invade your body, consuming a tasty bowl of Pho can help you feel better. If you live in the Hamilton or Toronto area and are looking for authentic, fresh, and healthy Asian cuisine, come visit us at Mi Pho Song Vu. Take a look at our menu online, and call us with any questions you may have.